In response to confirmed cases of rabies, as well as part of planned operations, the Ontario government distributes baits for foxes, raccoons and skunks to eat. The bait contains a small package filled with a rabies vaccine that is absorbed through the lining of the mouth. This is called oral rabies vaccination. Ontario has reduced the number of wildlife related rabies cases in the province by more than 99% since rabies control programs began. The number of rabid fox cases has dropped significantly over the past couple of decades. Raccoons can pick up various strains of rabies, but they are most susceptible to the raccoon strain. Until cases were found in December, 2015, Ontario had been free of raccoon strain rabies since 2005. Skunks primarily carry the Ontario fox strain. The last rabid skunk was reported in the province in 2012. 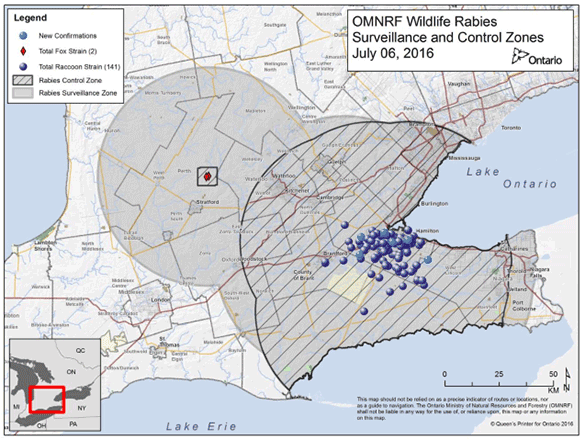 In early 2016, there was one bovine rabies case confirmed in southern Ontario. This is the first domestic case in the province since 2013. There were 18 rabid bats reported in Ontario in 2014. As bats in Canada are insectivores, no efficient way of vaccinating them has yet been found. In December 2015, rabies vaccine baiting took place in response to the positive raccoon rabies cases in the Hamilton area. By March 2016 there were 70 raccoon and 1 fox confirmed as having rabies and by July 2016 there where 141 confirmed raccoon rabies, mostly in and around Hamilton. The Ontario Ministry of Natural Resources and Forestry has undertaken a mass vaccination program, air dropping 220,000 baits that contain the oral rabies vaccine. As of July 2016, the surveillance and control zones did not include Dufferin County; however, both Peel and Wellington were within these zones. Pet owners are reminded that they are legally required to have their dogs and cats vaccinated for rabies. Additionally, livestock owners must ensure that horses, cattle and sheep are vaccinated if the animals have contact with anyone other than their regular caretakers (i.e. horses that go to competitions, livestock that go to fairs). In the event of human exposure to rabies, you should contact your local Public Health Unit. In Mono that is Wellington-Dufferin-Guelph Public Health. For wildlife, call the Ministry of Natural Resources and Forestry (MNRF) Rabies Hotline at 888‑574‑6656. If a sick or injured bat is found, consider contacting the Canadian Wildlife Health Cooperative (CWHC).